Fordham School of Law's former dean John D. Feerick represents not only one of the principal players in the historical drama of the 25th Amendment but also the visionary who is shaping it for the 21st century. 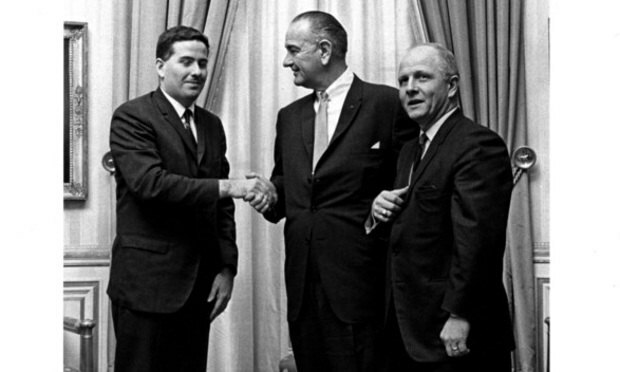 John Feerick with President Lyndon B. Johnson and Rep. Richard Poff at the White House in 1967. Photo courtesy of John Feerick. Last year marked the 50th anniversary of the ratification of the 25th Amendment to the U.S. Constitution. While many people know what the amendment sets forth—rules for presidential succession—fewer are aware of the personalities that made it happen. Chief among this amazing team of scholars, legislators, lawyers and government officials is John D. Feerick. Feerick represents not only one of the principal players in the historical drama of the amendment but also the visionary who is shaping it for the 21st century. Jennifer Grady, managing partner of Richards Kibbe & Orbe, spoke to the New York Law Journal about the advantages and challenges of being a midsize law firm in New York.